Tyddyn Mawr01341 422331work FarmhouseTyddyn Mawr is an 18th Century Farmhouse Bed & Breakfast, which is only 3 miles from the historic market town of Dolgellau in Southern Snowdonia. Providing the highest standard of customer care, owner Olwen Evans has won many awards including AA Guest Accommodation of the Year Award, AA Best Breakfast Award for Wales. Tyddyn Mawr has been lovingly restored offering superb 5 star farmhouse accommodation, lovely oak beams and log fires. 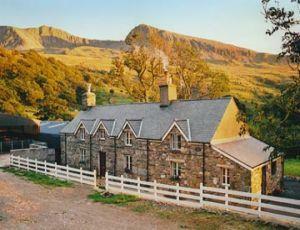 It is the perfect base to explore Southern Snowdonia. The farm nestles at the foot of Cader Idris amidst wild, stunning scenery and Tyddyn Mawr is a paradise for the photographer, walker, rambler, birdwatcher and artist. The luxurious accommodation comprises two relaxing, large and comfortable bedrooms - one on the ground floor with French doors leading onto the patio suitable for those of limited mobiliy, and one upstairs with a balcony for a stunning view of Cader Idris mountain. Both bedrooms are tastefully decorated with handmade Welsh oak furniture and luxurious bathrooms ensuring all guests have a memorable and relaxing stay. 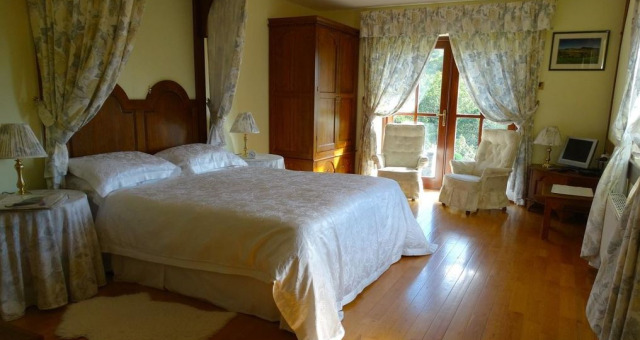 Tyddyn Mawr is an 18th Century Farmhouse Bed & Breakfast, which is only 3 miles from the historic market town of Dolgellau in Southern Snowdonia. Providing the highest standard of customer care, owner Olwen Evans has won many awards including AA Guest Accommodation of the Year Award, AA Best Breakfast Award for Wales. Sit, relax and digest the magnificent Cader Idris mountain, explore its mountain lakes or if you're feeling energetic, you can climb to the summit or just lie in bed and admire the landscape! Go to Dolgellau town centre. At top of square branch left. Branch left Garage up Cader Road for approx 3 miles. Tyddynmawr is first farm entrance on left after Gwernan Lake. The propery has 1 room and ground floor but has 1 step to enter the farmhouse. The ensuite bathroom has a corner bath. The room is big enough for a wheelchair but there is 1 step to get into the breakfast room. Owner is available to help if there are any difficulties.